Gurney's Potato Food | Gurney's Seed & Nursery Co.
Root crops, such as carrots, potatoes, garlic, onions, beets, and turnips, need the support of soil that's rich in potassium and phosphorus. Gurney's Potato Food includes these essential nutrients in just the right balance. The potassium in Gurney's Potato Food is plant based, so root crops benefit immediately. 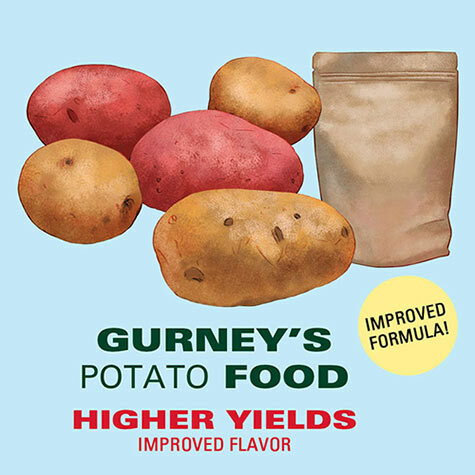 Application of Gurney's Potato Food will feed potatoes, carrots and other root crops steadily so they have nutrients available as growth requires them. Steady growth and adequate potassium results in root crops with better flavor and higher yields. Apply 2-3 lbs. per 100 sq. ft. when you prepare the soil, or side-dress when plants emerge to get greater coverage per pound of fertilizer.